We wrote this review to get you acquainted with the DW625’s features and why this power tool is easily one of the most loved routers today. We hope you find this article useful for when you finally decide to get the DW625 (pro tip: check online for the best price). It has a high-performance motor that allows for smooth plunges. The variable speed control feature makes the router compatible with any bit. The handles are not ergonomically designed. Like other woodworkers, our relationship with routers began with compact, fixed-base ones that we largely used for profiling work. Eventually, we got a little more adventurous and added mid-size fixed and plunge routers to the mix. It took us a while to realize that we were ready for a full-size router. We were already doing big projects with tougher applications and we felt that our existing routers could not quite keep up anymore. 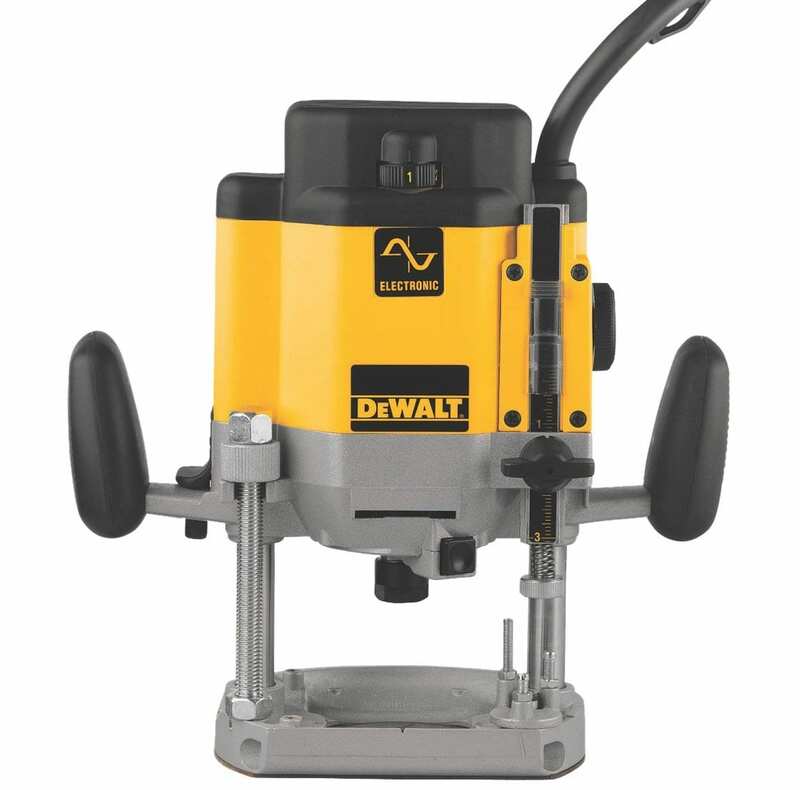 That was when we came across the DW625 3-hp variable speed electronic plunge router made by one of our most trusted power tool brands, DeWalt. It performs extremely well and must even surpass our other routers (combined) in capacity. We think the DW625 is a match for dedicated woodworkers who need a heavy-duty router for their shop. As a full-size router, the DW625 has the power required to pull off big projects and complicated applications. Also, since it is a plunge router, it can do everything. You can use bits of any size with it, use it freehand or on a table, or even convert it to a fixed-base router and it will deliver what you want each time. After working with the DW625 plunge router for some time, we are convinced it is the router any self-respecting woodworker should have in their shop. From decorative bowls and keepsake items to inlays and door signages, the creative design possibilities using a plunge router are endless. Cut a perfect circle out of your material by attaching your plunge router to a trammel that rotates around a fixed point on the workpiece. You can build a cabinet with trim using a plunge-base router. Compared to the old process of using chisels, using a router to make a cabinet takes much of the work out of setting the depth of each cut. It still requires skill the same way using chisels do, but you can more easily learn with a power tool. Mortises and tenons are just two of the most common finished products of plunge routers. Another common routing project, molding can easily, quickly, and simply be done with a plunge router. Since you get to use the router freehand, you have absolute control over the depth of the cut and the design of the molding. With the help of DIY or store-bought jigs, you can create different dowel setups. A plunge router is useful when you have to rout a pattern in a workpiece’s interior. You can do the same thing with a fixed-base router, but you will have to tip the router and risk injuring yourself or damaging your workpiece. Drill quickly and accurately by clamping the plunge router to the wood. The best thing about doing it this way is that the router’s depth stop mechanism will always prevent overdrilling. Weighing 11.2 lbs, the 5 ⅝ x 6 11/16-in DW625 is not as heavy or large as other full-size plunge routers. However, it makes up for that in power and performance. The DW625 has a 15-amp, 3-hp soft start motor that can handle difficult applications. It can be safely used with bits as small as 1 in and as large as 3.5 in because it has a full-wave electronic variable speed range of 8,000 to 22,000 rpm. Other features include magnified scale, phosphorus bronze bushings, and a fine bit depth adjuster. Each DW625 router comes with a half-inch and a quarter-inch collet, a dust extraction adapter, a template guide bushing adapter, and a wrench. Its 15-amp, 3-hp motor makes the DW625 a great workhorse. Such a powerful motor enables the router to handle tough operations without breaking down. The soft start feature makes the router gradually ease into your preferred speed after you turn it on instead of blasting at top speed right away. It helps you avoid uneven cuts and injury caused by the sudden jerking of your router. EFC, which stands for electronic feedback circuitry, enables the router to cut at a constant speed even with discrepancies in its load. This feature helps a lot especially if your workpiece has dips and the like. The DW625’s variable speed control makes it a good match with practically any bit. The slowest speed, 8,000 rpm, is the recommended setting for large bits measuring 2.5 to 3.5 in. On the other hand, the highest speed setting of 22,000 rpm is safe enough for small bits measuring 1 in. We took the time to read reviews of the DW625 plunge-base router before we decided to buy it. Most of the reviews were good and eventually led us to one of our best investments. An overwhelming majority of the comments are about how the DW625 plunges so smoothly and powerfully into any material. Meanwhile, there were some complaints about the plunge router’s depth when mounted on a table. However, some users were able to suggest a solution for it, which was to remove the plunge springs. There were other complaints but none were as frequently mentioned as the one about using the router on a table. So far, the only thing we found inexcusable was the design of the handles. They are made of hard, plastic-like material that can hurt if used for extended periods. To sum it up, it looks like the DW625 nails the one thing a plunge router is supposed to do. It does its job so well that people do not seem to have any hesitation in declaring it the best router they have ever used. The Speedmatic 5-Speed router is a massive plunge-base router with an equally impressive motor to match. It is a 15-amp, 3.25-hp motor that can take on the toughest applications without breaking down. The motor’s soft start feature prevents any unpleasant surprises by gradually increasing its speed until it reaches your preferred speed setting while its five preset speeds can match any bit size. This ensures a good cut done safely each time. Another cool feature is the adjustable depth stop turret and a self-releasing chuck for added convenience. With a base opening measuring 3.75 in, this router is designed to take on tasks of any difficulty level. In addition, Bosch has its own technology for easy and simple depth adjustments, which can be compared to the DW625’s rack-and-pinion mechanism. It runs on a motor with EFC and soft start technologies at a variable speed range of 8,000 to 21,000 rpm, has a spindle lock, and comes fitted with a dual-bearing plunge post for smooth and precise plunges. Similar to DeWalt’s DW625 router, Makita’s RP2301FC has a soft start motor with EFC technology and an electric brake that works in tandem with the variable speed trigger to increase productivity and maintain safety. The variable speed range of the RP2301FC is 9,000 to 22,000 rpm with a depth of up to 2.75 in. Combined with the router’s linear ball bearings, this speed and depth offer a smooth plunge and a powerful routing. If you are not quite feeling like having a variable speed plunge router, take a look at Makita’s RP1800. It has a fixed speed of 22,000 rpm and a depth range of up to 2.75 in. To make your job a little easier and reduce downtime, the manufacturer has put a quick-release depth adjuster and a shaft lock for bit changes. Some of the other features include a fan, a chip deflector, a lock-on trigger, an extended depth control knob for convenience during under-the-table routing, and double insulation. Like the other plunge routers in this list, Hitachi’s M12V2’s motor has soft start and EFC, which work together to provide a safe and consistent routing operation. It has variable speed control, the dial for which is located on the handle, right where you can most easily press it. It has a speed range is 8,000 to 22,000 rpm, which work well with bits ranging from 1 in to 3.25 in in size. Other features worth mentioning are the elastomer-coated handles, a dust guide, an optimized collet design, and a micro-fine plunge depth adjustment knob. Every woodworker will need to buy a full-size plunge router at one point. As a serious woodworker, you will eventually do more and more challenging projects that only an ultra powerful full-size plunge router like the DW625 can do. It may just be one of the routers that make the smoothest plunges in the market today, and that has not gone unnoticed by the woodworking community. It has a good motor that does its job well and has a list of helpful features that make the tool safe, convenient, easy, and simple to use. For the best price on the DW625, check online.